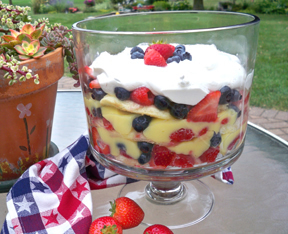 A scrumptious trifle recipe that can be served as a sweet salad or as a light, delicious dessert. 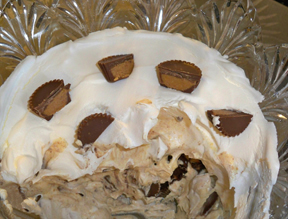 This versatile trifle will fit perfectly into your meal plan for any special occasion. Prepare the chocolate cake according to the directions on the package for a 9 x 13 cake. When the cake has completely cooled, poke holes all over the cake with a wooden skewer. Pour the Kahlua over the cake and in the holes. Let it soak in for at least an hour. Before assembling the trifle, cut the cake up into 1-inch squares. 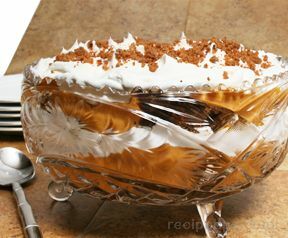 In a mixing bowl, combine the two envelopes of dream whip and instant pudding. Add the milk and vanilla; beat until mixture thickens. Break Heath bars into bite size pieces. Try cutting up with a knife or breaking by gently pounding with a hammer or mallet. Begin assembling the trifle by starting with a layer of the cubed cake pieces. Add half of these cubes. 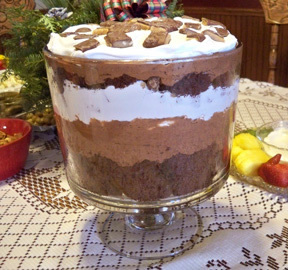 Then spread half of the mousse over the cake layer; then add a layer of Cool Whip. Sprinkle half of the broken Heath bars over the Cool Whip. Then repeat the layers with the remaining ingredients, ending with the Heath bars on top.